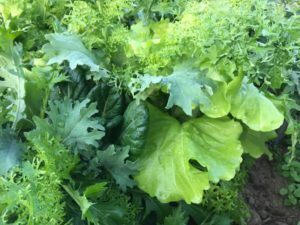 We have come to the final week our 2018 CSA, and we have a wonderful bounty to send you off with. Potatoes, sweet potatoes, garlic, kale, radishes, lettuce, arugula or salad mix (pictured left), beet greens or chard, baby fennel bulbs and kohlrabi should all be part of this week’s harvest. The farm has been touched with a few frosts over the last week. The frost, coupled with some cold, blustery days and leaves turning on the field edges have confirmed that we are well in to the fall season, and that winter is not far off. Before winter sets in fully we have much to do. 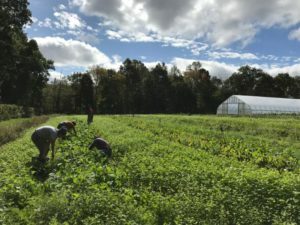 We’ll be sure all of our fields are in cover crop or mulch to protect the soil, we’ll plant our garlic and cover them with leaves, we’ll plant and sow hardy greens in the remaining space available in our tunnels for winter and spring harvest, we’ll shut down irrigation, prep tools and equipment for winter storage, and continue planning for the 2019 season. As we prepare for 2019, it is important that we reflect on the 2018 season thus far. In short, conditions this year were among the most difficult we have had in our nine-year production history here at Massaro, and I’m proud of the tremendous work our team has put in to face these conditions throughout, caring for our crops to deliver the harvest over these last 20 weeks. Every season has successes and challenges of course, and in planting a great diversity of crops and varieties, we build resiliency in to our farm, knowing that some things will fare better than others. But the struggles of some crops this year and total failures of others were more than we would like or expect in any year. Overall yields were down as a result, and we had periods particularly in August and early September where the selection was not as diverse or abundant as we would typically offer. Specifically, multiple plantings of zucchini and summer squash were nearly fruitless, bell peppers and other sweet peppers have been extremely limited, carrots were far less present than we plan for, most of the cabbage failed, delicata squash were not productive, and our fall spinach plantings were completely wiped out. In the U-Pick area, we’ve never had fewer cherry tomatoes, and our early snap and snow peas did not meet expectations. While those and other crops struggled, some of our favorite crops thrived. We started the year with our biggest ever strawberry harvest. So significant was the bounty that we opened up some of the strawberries for U-Pick, something we had never done before, to be sure that they you could enjoy as much of them as possible. Garlic scapes, herbs and giant heads of lettuce also highlighted the early season harvest; beets and cucumbers were staples from June through August; tomatoes were delicious, abundant and rolled in week after week just as we hoped; eggplant started slow, but came in heavy for this latter part of the season; salad greens were available every week of the season; spaghetti squash were a great new addition to the harvest; and the sweet potatoes we recently brought in may be the best we’ve had yet. How is it that so much can thrive, while other things struggle? There are no easy answers to this question. While we can point to the excessive rains we saw in spring, summer and fall, the extended stretches of high heat, and a seemingly permanent setting of 99% humidity for much of the season, we never get to control the weather, and it is our promise and responsibility to do our best as stewards of this farm and providers for this CSA no matter the conditions. Whatever the challenges, my hope is that the harvest we have provided this season has filled your tables, brought you continual nourishment and great enjoyment. Your feedback throughout the season is important, and we will be following up shortly with a survey. Each year we make small adjustments: trying new varieties, eliminating those that didn’t fare well, planting more or less of crops in response to your feedback, incorporating new tools, skills and approaches to specific crop management and overall field management. This helps us to ensure that, in our pursuit of a delicious, nutritious and bountiful harvest, we are taking great care of our whole farm ecosystem, including our farmers and our community. We’ll continue as such for 2019, and hope to have you with us for our 10th season of operation! Please note the 2019 CSA is now open exclusively to you. Registration forms are available at the farm and you can also sign up online at our website. Note that there is a discounted rate for paying by check/cash and a special discounted rate if you pay in full by December 1st. And if you pay in full before the end of this year’s CSA, we’ll also send you home with a free jar of our Green Tomato Salsa! We offer this to thank you for the commitment you have made to your community farm, and because it is extremely helpful to us when you sign up early. So as you visit the farm and pick up your produce this week, please consider making a deposit, a full payment or payment of any amount towards next year’s CSA. We will continue to harvest everything we can, and will make it available at the New Haven farmers’ markets we attend: Wooster Square on Saturdays, 9am-1pm; Edgewood Park on Sundays, 10am-1pm. We may also set up a stand in the barn during the week so that you can continue to have access to produce here at the farm. Stay tuned for details, and until then, thank you so much for spending the 2018 season with us. We have loved seeing you each week, and look forward to seeing you when we can the rest of the year, and again in 2019.